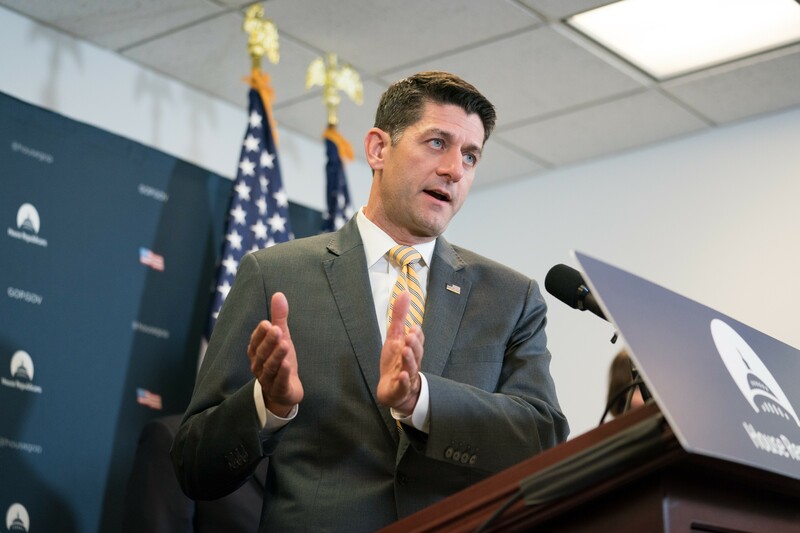 House Speaker Paul Ryan (R-Wis.) speaks during a weekly news conference on Capitol Hill in Washington, June 6, 2018. WASHINGTON — Speaker Paul Ryan, the self-styled conservative thought leader who struggled to govern in the era of President Donald Trump, declared Wednesday that politics in the U.S. is “broken,” sounding a parting message of alarm about the outrage-fueled discourse of the day even as his exit from Congress seemed to underscore it. Ryan, a former vice-presidential nominee from Wisconsin, reluctantly accepted the mantle of House speaker in 2015 after House Republican hard-liners torched his predecessor, John Boehner. He used his farewell address to defend his brief record and burnish a legacy of dubious accomplishment. Those achievements include the enactment of large tax cuts, especially the significant lowering of corporate tax rate, but they left in their wake an enormous and growing federal deficit. He waxed regretful about his inability, after years of talk, to restructure Medicare and Social Security and rein in the largest drivers of the nation’s debt. Ryan used his final moments as speaker to point to the deeply corrosive nature of politics in the age of Trump, effectively diagnosing the forces that weakened him and ultimately led a man once viewed as the party’s future to retire from one of the most powerful posts in Washington at the age of 48. Ryan never spoke Trump’s name — although he made a late edit to his remarks to add a single mention of “the president and the vice president, who became my partners in government” — but his speech was a stinging indictment of Trump’s breed of politics.